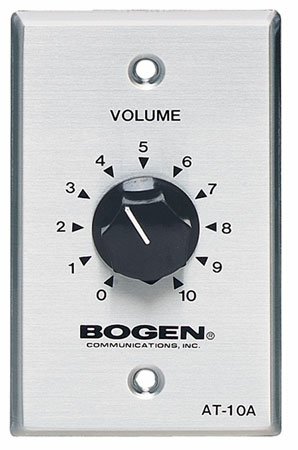 The Bogen AT10A attenuator allows the output level of a network of 25V or 70V speakers to be controlled from a wall-mounted volume control, without affecting overall amplifier volume settings. The AT10A can handle speaker loads of up to 10W. Volume reduction takes place in 3 dB increments except for the two lowest settings, which provide 6 dB reduction increments. These rugged attenuators have 10 levels of sound control, plus an off setting.